The response to our Metal Claws Wolverine column was overwhelmingly positive, but it stirred up a whole slew of new questions. To help everyone get into the customizing spirit, we offer you an update of a "how to" column that was originally written years ago. If you're going to customize figures, you need more than just the perfect starting figure. You also need a bevy of tools to help you get the best results possible. This is a list of the materials that would make a great starting kit for anyone who wanted to craft their own figures. Many times, figures have details, accoutrements, and other extrusions that need to be removed in order to turn them into particular custom figures. The most basic tool for removal of these details is a knife. I use a Swiss Army knife, because I always have one with me and it works well. However, I'd recommend getting an X-Acto knife with a #11 blade. The X-Acto is your friend; the X-Acto is essential. Be darn careful with the X-Acto, however, because these things are sharp. Sharp enough to cut through time. Always cut away from yourself and always keep your fingers away from the blade when you're working. I do neither of these, and spend a lot of money on Band-Aids. Of course, a knife can only do so much. When you're done cutting away at your figure, you'll no doubt want to smooth things out with some rough-grit and fine-grit sandpaper. And sometimes sandpaper can do things a knife can't. For instance, when I made Prometheus from a Batman and Robin Radar Batman, I found that rough sandpaper was far more effective than a knife in getting rid of wide, flat details like the raised bat-symbol on the figure's chest. A sanding sponge is also handy for sanding curved surfaces like limbs. Many people use a Dremel, a tiny rotary tool that has different attachments for sanding, cutting, etc. Dremels are very expensive, however, and a knife and sandpaper will do the exact same job. It's a great tool, though, and worth considering. Also, make sure you have a good pair of pliers - sometimes you just need to get a good grip. Needlenose and standard. Once you've stripped your figure down, you'll probably want to build it up with new detail appropriate to the figure you're making. I've found that the easiest way to do this is to use air-drying Das Pronto clay, since it doesn't need to be baked like Super Sculpey. Other customizers swear by Sculpey, though, so if you don't like Das Pronto you may want to give Sculpey a try. Check your local craft stores for the stuff, and if they don't have it, ask them to order some for you. There are many different kinds of modelling clay out there - Castiline, Fimo - so don't be afriad to experiment and see which kind works best for you. Another excellent clay is Crayola Model Magic. This is useful for adding skirts to female figures or the bottom of a tunic for male heroes like Dr. Mid-Nite or Mr. Terrific. It's also air drying, and remains semi-flexible. Unfortunately, it's extremely hard to store the stuff for later use once opened, so it's best to have a selection of projects that need it lined up before you begin. You'll need tools to sculpt and manipulate the clay, like an old X-Acto knife to cut sheets of clay and carve details. You can also use toothpicks, paper clips, and safety pins to carve out smaller or finer details. A fat marker is good for rolling and flattening sheets of clay, from which you can cut belts, boot cuffs, and the like. You'll also need someplace to work with your clay. I used to use the latest issue of Comic Shop News as a sculpting surface, since they were free every week. Now I use old Previews catalogs. They're smooth, they're neat, and they keep your clay from getting all over your workspace, whether it's your desk or the dining room table. If you want to attach something to a figure, you're going to need glue. I recommend whatever type of Super Glue you can find. It dries fast, it holds tight, and it probably won't burn your fingers if you touch it. Just don't glue your fingers together. As for things you might want to add to a figure, the sky's the limit. There've been press-on nails used as shoulder pads and thumb-tack heads used as Kirby discs. All I can recommend here is to look at everything you see as a potential action figure add-on. Sure, you'll get weird looks, but you'll also find lots of neat stuff for your figures. Also, never throw anything away. If you pop off a body part, keep it. If you take off a cape or some other accessory, keep it. You never know when these scraps will be just what you're looking for. I even keep those plastic twist ties that come on so many figures these days. In a pinch, they can be used for just about anything. The fist step in painting a figure is to give it a thin coat of white paint. I get the big bottles of white acrylic paint that can be found in any craft section, and cover the entire figure. You could also use white acrylic spray primer, which would be much quicker. Some people report having taken a drywall screw and a wire coat hanger to make an apparatus from which to hang figures. This lets them spray the most even coat of primer they can and allows them to hang the figure up to dry when they're done priming. I paint my figures with acrylic craft paints. You can find these in any good craft store. For starters, you'll need white, yellow, red, blue, and black. You can mix just about any color you need with these. I also recommend at least one skin tone (you can tweak it with the other colors so that your figures aren't all the same shade), and green just because it's a common color that seems to be hard to mix for some reason. You can buy more colors as the need arises, but these are a good mix to get you started without spending too much money. Of course, you need brushes to paint your figures. I get by with three: two smallish model brushes and one tiny, sharp brush called a "spotter." The spotter is used for eyes and small details. I also use toothpicks and other small implements for tiny detail work. Once a figure is well and fully painted, seal it with a coat of acrylic coating to keep the paint from chipping or flaking away. I use Citadel Matte Varnish. Matte. Matte. Matte matte matte matte matte. Never gloss. A nice matte finish will be invisible, protecting your figure in secret. 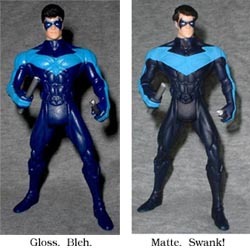 Gloss, however, will make your figures permanently shiny. If you want your figure to be shiny, you can do that afterward. Really, I mean it, only matte. I hope this has been a good starting point for any of you who are just starting to customize or are interested in making your own figures and aren't sure how to start. Look around at other people's custom works, and use their recipies. Improve on them. Make them your own. As you do more and more figures, you'll start to notice things to use as accessories and have your own brain storms about how to make your favorite hero out of another darn Batman figure. The only real limit to what you can use to make figures is your own creativity!